I don't recall where I first saw this idea online, but I thought it was something really cool and decided to create something similar of my own. 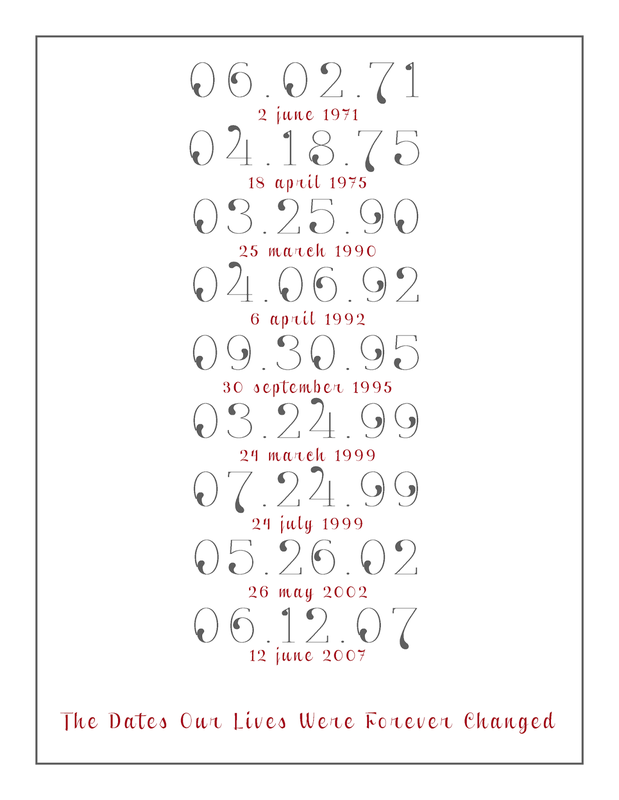 Using Microsoft Publisher I created a "poster" of important dates in my family's lives ... births, day I met my spouse, anniversary, etc. What a great thing to have framed as a reminder of the things we have to be thankful for - the moments in our lives that have brought us to the place we are today. I just had to share this because it's so simple to create, but makes such an amazing statement. I, also, think it would be a great gift for a friend or family member ... so inexpensive, yet very meaningful and personal. 01/30/14: Updated print project photo. I do not mean to picky but I was wondering if that is a typo on the second line? Wouldn't it read 2 June 1971?